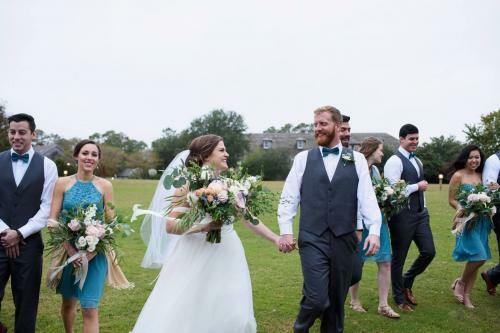 If a waterfront ceremony and beautiful coastal setting are on your venue wishlist, consider Roanoke Island Festival Park. 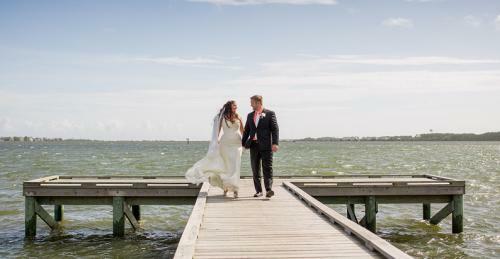 We offer several venue options for Outer Banks weddings of all sizes. If your outdoor wedding plans need to change due to weather, we offer backup venue locations indoors. Parking is included in all rental packages. Please note that a wedding planner or day of coordinator is required for your event. The Pavilion Stage is 2,800 square feet with another 1000 square feet of dressing rooms, and offers a unique opportunity for your event. The stage is located on the Roanoke Sound surrounded by the expansive pavilion lawn. The area behind the stage, on the water, can be used for the ceremony or cocktail party. Bathroom facilities are included. Custom lighting and design options available for additional fee. The Elizabeth II is a representative 16th Century vessel. The location of the ship is unique for a special event. The venue offers connecting decking suitable for seating or standing. Events cannot be held on the ship during operating hours of 9 a.m. to 5 p.m. and only during daylight hours. It is also limited to certain months of the year. The Grand Mall is 2,680 square feet. It contains a small bar area with sink and large bathroom facilities. The use of this area is limited during operating hours of 9 a.m. to 5 p.m. The Event Room is 2,230 square feet and is perfect for receptions. It features a piano that can be used for events and also some outside deck space. It is located in the Administrative Building with an adjoining small gallery kitchen and bathroom facilities.